GLD Battery is part of the brand new line of professional LED Portable Lamps designed by Generac Mobile®. Extremely lightweight, completely indipendent and with its low temperature, this remarkable LED lamp proves to be suitable for a wide range of application fields. It is powered by a rechargeable battery. Battery charger included. 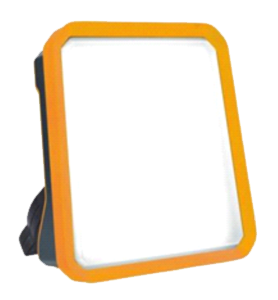 Housing in plastic anthratice/orange (polycarbonate) with edge guard made of soft thermoplastic elastomer (TPE), plastic cover in opal polycarbonate, handle black in plastic ABS, 2-step switch (50/100%), Li-Ion Battery 95 Wh with charger.